Stylish Historic HGTV Downtown home - Bikes, easy parking & walk everywhere! Treat yourself to an extraordinary stay in this stylish HGTV featured home!!! ! 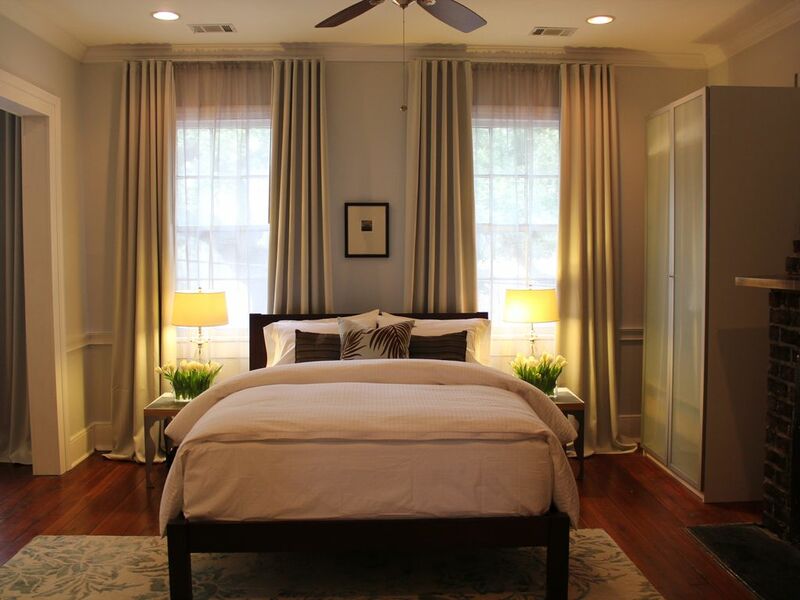 The Pied-a-terre, Suite II offers luxury amenities and is conveniently located in the heart of the Historic District next to Crawford Square, an easy 5 minute walk to River St. The two bicycles make exploring the Historic Landmark District easy and fun! This stylish 900 sq. ft., one bedroom, one bath home is a comfortable place to come home to after a long day of touring. Our amenities include a large soaking bathtub, open and airy living room, gourmet kitchen, and complimentary bottled water, cokes, coffee & tea. For guests staying three or more nights we also offer either a complimentary bottle of wine (red or white, your choice) or juice, and assorted cheese & crackers upon your arrival. Savannah Pied-a-Terre, Suite II is surrounded by beautiful majestic moss-covered live oaks and only 5 minutes walking distance to River Street or Forsyth Park. Just steps away from Crawford Square and downtown shopping this home is the perfect origination point for all your Savannah excursions. Don't be fooled by other 'historic locations' if the home is not located north of Gaston Street, it’s not within the historic district! This historic home features modern upgrades (granite countertops, glass tile, over sized tub & shower, stainless steel appliances) while maintaining the historic charm (original heart pine flooring, crown molding, soaring ceilings) you expect when staying in Savannah. We are pleased to welcome you with complementary Sodas, Bottled Water, Starbuck's Coffee, Tea, Creamer & Sugar, & complimentary secure Internet Access (wifi and ethernet). The kitchen is stocked with spices, condiments, full gourmet stainless Cuisinart cook and bake ware – everything you need to fulfill your culinary desires. With luxury that equals any 5 star hotel, our upstairs Suite provides the finest amenities to the discriminating traveler. Our master bedroom features a memory foam topped queen-size bed and is beautifully appointed with luxurious fine linens, ample storage, seating, and dressing areas. The bath is fresh and modern. This highly appointed space includes luxurious bath towels, thick robes, glass tile surround, marble floor, and double sink. Relax at the end of your day and pamper yourself in our over sized 6' soaking tub or shower with our complimentary bath products including shampoo, body wash, bubble bath, and body lotion. The modern gourmet kitchen is fully furnished with Viking refrigerator, dishwasher, microwave, integrated cook top, oven, and granite countertops which allow you to prepare your own meals in style or simply keep snacks and other items on hand. Enjoy wireless Internet anywhere in the home, or plug in directly to secure high speed Internet. The living area offers a comfortable sofa, flat screen 32” HDTV, DVD player, assorted Savannah related books and movies. The space provides room for total comfort and relaxation with either a good book or to simply watch a movie in the evening. Savannah is a wonderful walking city, but this property also offers the use of two touring bicycles during your stay. Located downstairs in a convenient storage unit, two bikes are reserved for our Suite II guests. This unit has ample on-street, metered parking Monday through Saturday, from 8 a.m. until 8 p.m. right in front of the home. Rates are $1 per hour ($12 per full day). You do not need to pay the meters on Sunday. Limited free parking is available on Price Street next to the home. The city has a free parking app (ParkSavannah) which allows for adding time conveniently directly from your phone without having to physically be at the home or metered spot. Simply park your car and forget about it as the home is also less than 1 block from the FREE city trolley that loops around the historic district! Please note, no Saturday arrivals or departures are offered for this home. Please adjust your travel dates if you sent an inquiry for a Saturday start or end date. For Same Day (arriving today) reservations, please contact me directly via my cell 843.991.4962. Please note Suite II is not suitable for children. Note that Suite II also accommodates a maximum of two adults only. Maps, guidebooks, and local Savannah periodicals will keep you abreast of that all Savannah and the low country have to offer during your stay. Also on hand is an assortment of books and DVD’s should you decide to lounge comfortably inside during your stay. This home is fully licensed by the City of Savannah (SVR-00001). ALL Vacation rentals are now required to post their Certificate number on their listings; beware of unauthorized or illegally operating homes. This home is locally owned and operated. When you email or call you are speaking directly with the owners not a management company. We live in Savannah and offer personalized service and meet all our guests upon arrival for check-in. You are our guest during your stay in this beautiful city and we endeavor to make your stay as comfortable as we can. This home was a real charmer with it's large Live Oak tree out front and in a perfect location! Since it hadn't been redone, we were able to save so much of the original details that are so often taken out in many renovations. Kept it historic, but also updated it in a stylish yet appropriate way. I love the neighborhood feel yet, so close to restaurants and shopping in the historic district. Unlike other owners or management companies, we offer a very personal touch which includes meeting all our guests at the home for check-in, and providing customized walking maps with points of interests and recommended tours, shopping, and restaurants. I pride myself on offering extremely personalized service, realizing that each and every guest and their visit is special. Since we live locally in Savannah, we are available anytime both before and during your stay for any questions or assistance needed. I look forward to hosting you at the Savannah Pied-a-terre, and showing you why Savannah is considered the Hostess City of the South! Oversized 6' soaking tub with overhead shower. Bath and body products provided for your stay. Located in the Heart of the Historic District! Combination washer & dryer in one unit. Spices and Condiments stocked in the home. Assorted videos on hand including Midnight in the Garden of Good and Evil, set in beautiful Savannah. Two Schwinn touring bikes for your use. Locks included. Small garden bench outside in front of the home. Guests staying for 3 nights receive a bottle of wine, with cheese & crackers on arrival. Home amenities include a Beach basket & beach towels, sunscreen, cooler and picnic blanket for a beach or park picnic! My wife and I highly recommend this amazing romantic apartment in Savannah. The location is perfect - walking distance to every thing. The comfort and coziness made this the ideal weekend getaway. Everything was there for out use. Nothing was missing. Amazing hospitality. Parking available right outside the front door. We couldn’t have asked for more. Great place, location, very clean! Had a wonderful trip. Great place in awesome location, and couldn’t have gone any better! Place was super clean, and Heather was fantastic and very helpful! This was our first trip to Savannah, and we thoroughly enjoyed it. The apartment was cozy and comfortable. Heather added many homey touches that enhanced our experience. She also gave us many wonderful dining recommendations. The location was ideal - away from the crowds, but within easy walking distance to the squares and historic homes. We highly recommend it. Clean, comfortable, good location. Owners were very helpful. My wife and I thoroughly enjoyed our stay here, everything was as advertised. The bed was very comfortable and the location was absolutely perfect. Walking around Savannah from here was so much fun, what a great city to visit. Thanks to Heather for the customized map she provided us, we referred to it constantly and her suggestions for where to go and where to eat and drink were wonderful-everything from great dive bars to fancy joints! As the title says the location of this apartment was wonderful. We parked the car and walked to everything. Restaurants, shopping, touring. The place is perfect for a couples get away, would recommend it to everyone. Our host has thought of everything and makes sure your stay is comfortable. 5 minute walk to River St or Forsyth Park. Centrally located in the Historic District; walk to restaurants, bars, walking tours, ghost tours, carriage rides, and museums. Two bikes for your use during your stay!